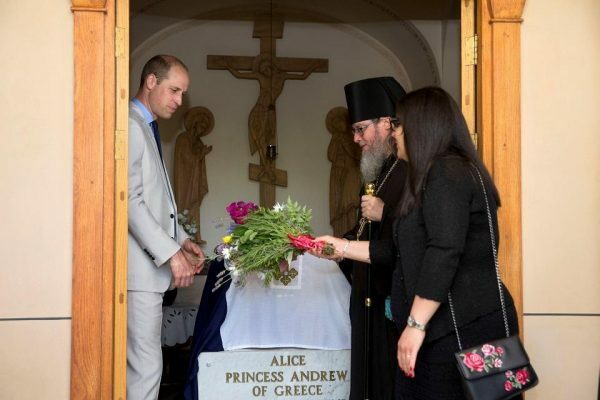 On the first-ever official visit of English Royalty to Israel, the grandson of Queen Elizabeth, Prince William, Duke of Cambridge, visited the Monastery of St Mary Magdalene in the Garden of Gethsemane on June 28, 2018, where his great-grandmother, Princess Alice of Battenberg, is entombed, and the relics of his great-great-great-aunt St Elisabeth lie in the church. His Royal Highness was greeted at the gate of the monastery by Archimandrite Roman (Krassovsky), Chief of the Russian Ecclesiastical Mission in Jerusalem, who escorted Prince William into the church. On the terrace before the church, Fr Roman pointed out the holy places of the old city of Jerusalem seen from there. Abbess Elisabeth (Smelic) greeted him with the traditional bread and salt. The high guest entered the church with the nuns singing the troparion of St Mary. The head of the REM intoned petitions for the health of Her Majesty Queen Elizabeth, His Royal Highness Prince William and for the Royal House of Windsor. Afterwards he intoned Many Years. Afterwards His Highness also lit a candle at the reliquary of St Barbara. Prince William spoke briefly with Mother Elisabeth, who is from Australia, and therefore a member of the Commonwealth. The Prince proceeded to the crypt of his paternal great-grandmother, Princess Alice. Fr Roman intoned a memorial litiya for the Princess and sang Eternal Memory. His Royal Highness was left alone for private prayer at the coffin. Afterwards, one of the girls from the convent’s affiliated Orthodox Bethany School presented flowers. The Prince thanked Fr Roman and graciously presented the convent with an icon of SS Mary and Martha (the heavenly patronesses of an orphanage which Princess Alice opened in Athens). He asked that it be hung over her coffin. After a short conversation with Fr Roman, Prince William was shown the archeological findings of the ancient road upon which our Lord, Jesus Christ entered Jerusalem. The Prince departed the monastery seemingly touched by his visit. Soon after the Princes’ visit, the grave of Princess Alice was visited by Evy Cohen, a granddaughter of the Jewish family whom Princess Alice hid from the Nazis during WWII. For her courage, Princess Alice was named “Righteous Among the Nations,” the highest honor given to a non-Jew by the State of Israel.